Back with another book review. 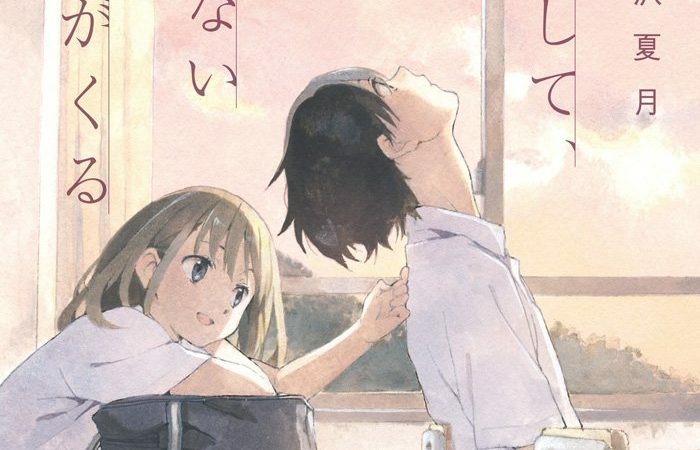 Last month I read the light novelそして、君のいない九月がくる (Soshite, Kimi No Inai Ku-gatsu Ga Kuru) by 天沢夏月 (Amasawa Natsuki). Media Works Bunko published this light novel on October 24, 2015. During their sophomore year summer vacation, Keita suddenly died in an accident. His closest friends, Miho, Taiki, Shun, and Rino, were left in shock by the news of his death. Not too long after Keita’s funeral, Kei appears. Kei looks like Keita, sounds like Keita, and has Keita’s memories, but he isn’t Keita. Instead, he is Keita’s doppelganger. Kei needs the groups to fulfill Keita’s dying wish, but this means they will have to go to the spot where Keita died. Confused, the four friends set out on a journey to retrace Keita’s steps while coming to terms with his death and their friendship. This book has two main sections. The title for this section is named “Kei,” but he doesn’t particularly narrate the story. This section mainly deals with Kei trying to get Keita’s friends to agree to go along on this journey. Naturally, all of the characters are very suspicious of Kei. Maybe him popping up out of nowhere after the funeral wasn’t the best idea. Also, suddenly telling people to go to the place their friend died but not giving any extra information might be a minor red flag. However, since there would be no story if they didn’t go, after some minor mishaps they set off on their adventure. Through this section, you start to see the beginnings of the relationships between all of the characters, but it feels very neutral. That might be because this is from Kei and Kei doesn’t have any connection to these people, he’s just there based off of Keita’s memories to get some help. From Kei’s point of view, almost anybody would suffice for his goal, but nobody else can see him. Section two of the book has into four chapters, and each chapter is from one of Keita’s friends. They also read in the order of who has known Keita the least amount of time to the longest. This is a minor detail that explains something that happens later on. Within each of the friend chapters, you get more background between the narrator and Keita. The narrator generally tells more about how they met and their honest feelings towards Keita. High school relationships are often complicated, and their friendship with Keita isn’t any different. While reflecting on their relationship, these some of these kids have to come to terms with having said or done something to Keita before he died for which they can no longer make an apology. Others harbor secrets about Keita that he didn’t tell anyone else. These chapters help build a complete image of who Keita was as a person. However, it takes all of these chapters to do that well. None of the friends had a whole idea of who Keita was as a person, but together everything makes sense. As mentioned, the friends have to come to terms with their feelings towards Keita while he was living. Because they are in high school, the themes were along the lines of jealousy, rivalry, suicidal thoughts, and of course love. Because of how close these events happened to Keita’s death, there was a lot of self-blame floating around even though in reality his death was just an unfortunate event. I’m sure Kei just wanted them to hurry up and get to goal, but everybody moves at their own pace I guess. I would give this book a 3 out of 5. It was a solid light novel. There’s a little plot twist at the end that I wasn’t expecting, which was interesting. I liked the exploration of Keita’s friendships and the effect that ending on bad terms had on them. It is a good read if you’re interested in books about high school relationships or young adult themes. I give it a three because it was a nice book, but I wouldn’t particularly want to reread it, especially compared to the last two books I read. If you’re studying Japanese, I think this book is a solid N3 level. There isn’t much about this book that you would find extremely difficult if you’re around the N3 level. Because the story is told from high schoolers’ points of view, the tone is very conversational. I think that makes it a good way to see how friends typically interact around that age group.